This smudge kit contains the basic items required for a white sage cleansing ritual and its display upon an altar or within scared space. 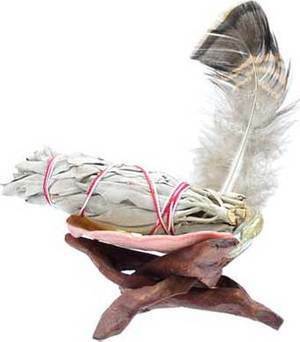 A white sage smudge stick or wand approximately 3 inches in length is accompanied by a smudging feather, an abalone shell to catch the ashes that is approximately 2 inches across, and a small cobra stand to set the shell upon. Light the sage stick or wand at one end allowing the smoke to permeate the space and objects within. Once burnt past the last wrap place loose sage in the abalone shell, and continue to allow the sage to smolder.